Chess World Cup September 3 2013 - Vladimir Kramnik is the winner of the event. Here we go for the final championship of Chess World Cup 2013 where Vladimir Kramnik and Dmitry Andreiken emerged as the finalists of this great event after 6 rounds of the 128 players knockout stage chess battle. Let's wait for 1 more result between Kramnik and Andreikin. CONGRATULATIONS TO VLADIMIR KRAMNIK FOR WINNING THE WORLD CHESS CUP 2013! The Chess World Cup was organized by FIDE that will be held from August 10 to September 3 in Tromsø, Norway. The World Championship Cycle 2014 is in relation to this chess event that the winner and the runner up will be qualified to play for the World Championship cycle 2012-2014. There are 128 players of this event in all over the countries like Philippines which our Filipino chess players' GM Wesly So, GM Oliver Barbosa, and GM Mark Paragua are there to play. The style of the event is a knock-out stage or single elimination. UPDATE as of August 16: GM Wesley So lost to GM Tomashevsky. In first game, GM So lost to GM Tomashevsky while drawn happened in the second round resulting to 1.5-0.5 match in favor to the Russian GM. GM So is now eliminated in the 2nd round of Chess World Cup 2013. Philippines' number 1 chess player Super GM Wesley So (Elo 2708) advances to the next round after defeating GM Alexander Ipatov (2583) of Turkey with 1.5-0.5 score in favor of the Filipino GM. GM scored a first with white while draws in the second dame against GM Ipatov. Wesley So, the country's lone super GM deserved to be the Philippines' chess sensation at his young age where he started reigning in our country and this should motivate him more to drive to his limits pushing towards the championship. In the second round, he will face the winner of GM Evgeny Tomashevsky of Russia (ELO 2709) and GM Alejandro Ramirez (ELO 2583) of the United States who happened to battle for a rapid play-off after their standard game resulting a draw both in first and second game. While our two Filipino GM's, GM Mark Paragua (ELO 2545) and GM Oliver Barbosa (ELO 2572) was out in contention after losing the first and two games in their higher seed rivals. GM Paragua lost to 28th seed GM Dmitry Jakovenko of Russia (ELO 2724) in their two-game standard play while GM Oliver Barbosa lost to 29th seed GM Le Quang Liem (ELO 2712) of Vietnam both the first and second game. It was a terrific battle as both GM Barbosa and GM Paragua game their best shot in this Chess World Cup 2013, it was just their luck was not their helping them playing against the Super GM's. For you to know the current standing and game results in every round, you can do visit here in every other day to learn some of the best games that will be published in here. NOTE: There are blank fileds in the QUALIFIED section since some games drawn in the 2 standard games and subject to play for 2 rapid games en route to qualifying for the next round. This table will be updated from time to time. 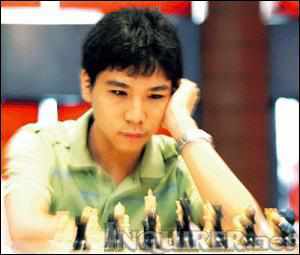 GM Wesley So is the only Filipino GM from Philippines who proceeded to the next round of this event. He will faced the tougher seed between the winner of GM Evgeny Tomashevsky and GM Alejandro Ramirez. Please visit for the next round updates of Chess World Cup 2013. Until for the next installment World Cup 2013 updates by FIDE.